Comtrol’s IO-Link Master supports Data Storage, which allows an IO-Link device to be automatically configured using previously stored values. Port 2 – configured for automatic upload and the IOLM is storing the data for the device on the port as displayed in the Storage Contents field. If desired, manually download the stored data to another of the same device. 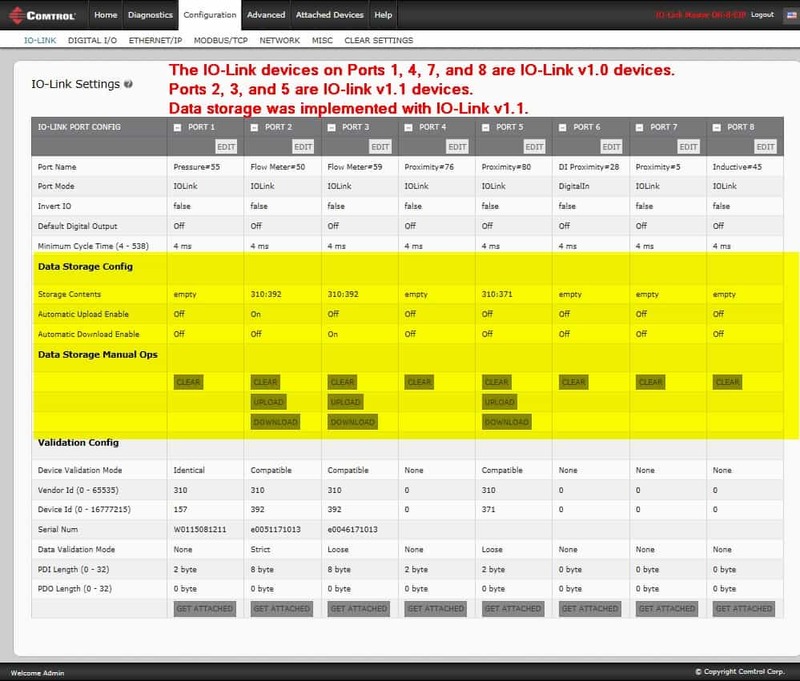 Port 3 – a manual UPLOAD was performed (Storage Contents field) and the port is configured for automatic download, which means that if the existing IO-Link device is replaced with the same IO-Link device model, the IOLM automatically loads the data storage onto the new IO-Link device. Port 5 – a manual UPLOAD was performed and if necessary, automatic or manual download can be used to load the IO-Link device or another of the same model.